Forbush Corner: Larry is headed out with the Pisten Bully PB130 tiller/track-setter to prepare some of the trails this morning. Conditions will most likely be “variable” but there is still skiing to be had before the snow is all gone. Trail fee via donation. Open today from 1 PM to 5 PM. Founder’s Day Celebration tomorrow in rembrance of Dave Forbush. We will be around the Ski Shop all day so stop by anytime. We are also planning to visit Dave’s Memorial Site and to have a potluck dinner afterwards. If you are interested in joining us for dinner please bring a dish to pass. XC Ski Headquarters: Our snow base on the trails continues to hold, with a small number of thin spots, bare spots, and icy spots. 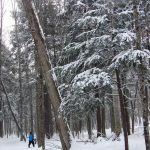 The Trapper’s Cabin, Wild Turkey, and Mackinaw Cut trails are in skiable shape, but because of some icy downhills, Rolling Hills and Manitou should only be skied by experienced skiers. Rock skis are recommended due to the bare and icy spots. Skiers are welcome to borrow rock skis or metal edged skis from us if needed. We will not be grooming today as it would be counterproductive in these warmer temps.